Wishing everyone the best during this holiday season as we are getting busy decorating our homes and getting our presents bought or made. It is such a busy time of year but I am hoping you are able to make a few Christmas Cards and maybe some tags to go along with all that is being prepared. I love this Quilted Santa and hope he inspires you! I am making a few of my tags and cards using him!!! Emboss Christmas Wishes sentiment on red card stock using Detail White Embossing Powder and VersaMark Watermark Ink. Adhere teal and red card stock to front of card. Stamp Quilted Santa to Mixed Media Paper, color with Chameleon Markers. Adhere to teal pattern paper. 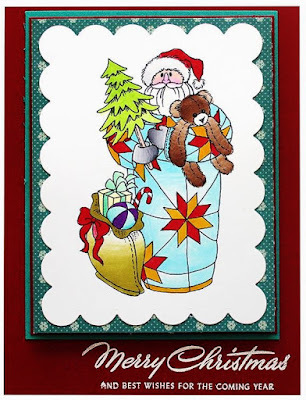 Place matted Quilted Santa on front of card with pop dots. I am so glad you stopped by and hope you enjoyed my Quilted Santa Card. I hope you check out all the beautiful holiday projects that are being shared by the Stampendous Design Team. I am sure there will be cards, tags, gift giving ideas and so much more. This is so pretty! I love the coloring!! TFS! I have some friends who love to quilt who would love to receive a card made with this stamp. This is such a pretty card! So very FESTIVE! You did fabulous coloring on this Santa and added such a fun sentiment to go with it. Thank you for sharing today!